Nagoya Hill Superblock is a mix-used development that delivers the most complete and most modern shopping center. Supported by a very strategic location, make Nagoya Hill Superblock as No. 1 Central Bussiness District (CBD) in Batam. 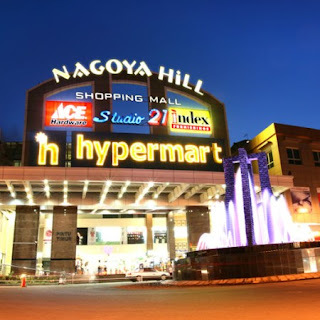 Is the largest and most comprehensive mall in Batam, with innovative design and is equipped prestigious shop plus extensive parking facilities make Nagoya Hill Superblock "One Stop Shopping And Fun" for you and your family. Located right in the heart of Batam and surrounded by Hotels, Offices, Banks, Hospitals, and Ferry Terminal. ease of access is an added value in addition to the typical features of Nagoya Hill Superblock include: Electronic and Mobile Centre, Food Street, Shoping Street, Exhibition Area, Game Centre, Cinema Studio 21, etc. Nagoya Hill Superblock building consists of three floors with effective site of more than 60,000 m2 and could accommodate more than 1,500 four-wheel vehicles in the parking garage directly connected to the mall area. Building facilities consist of AC Central, 5 lifts Passenger, 2 elevator units in the loading area, 10 units of escalators, 2 travellator units, four units of the emergency stairs, 8 door access entrance mall, two units of the entrance area nagoya hill. Supported backup electrical power source capable of supplying the electricity needs throughout the building, installation of electrical wiring telephone, and fiber optic internet, Installation Springkle (smoke detector) and Fire Detector, complete security equipment and monitored. Make your shopping experience a quiet and unforgettable.